If you believe the tourist brochures, Guilin is a pleasant city situated in a beautiful limestone kharst mountain environment. However, despite its attractions, this city in Guangxi province is not worth visiting for its own sake. It’s not the type of town to be out on the streets at night. Think of it as a transport hub for iconic Yangshuo and the impressive Dragon’s Backbone Rice Terraces. Those places are well worth visiting (click photos to enlarge). I had visited Guilin twice before. The first time to catch a boat down the Li River to Yangshuo, and the second time to connect with a flight home to Australia. This time Guilin would be my departure point for a journey by local transport across northern Guanxi, through the poor province of Guizhou, and up to my Chinese home in the municipality of Chongqing. 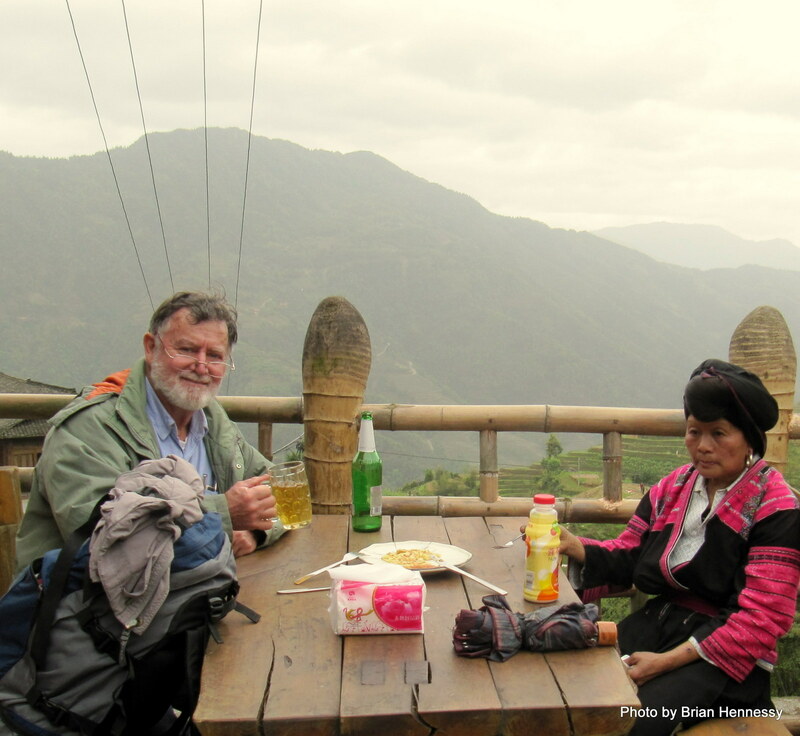 My plan was to enjoy the scenery, appreciate the ethnic diversity, and generally get a feel for what life was like in this lesser known part of China. This isolated and mountainous region of the Middle Kingdom is where minorities such as the Dong, Miao, Yao, and Zhuang migrated to after being pushed out of northern and central China by the dominant Han Chinese. It was also the place where you might have been banished to if you had fallen out of favour with the Emperor. An unpopular region in those days, it remains a backwater today, despite the efforts of local governments to promote tourism and encourage economic development. 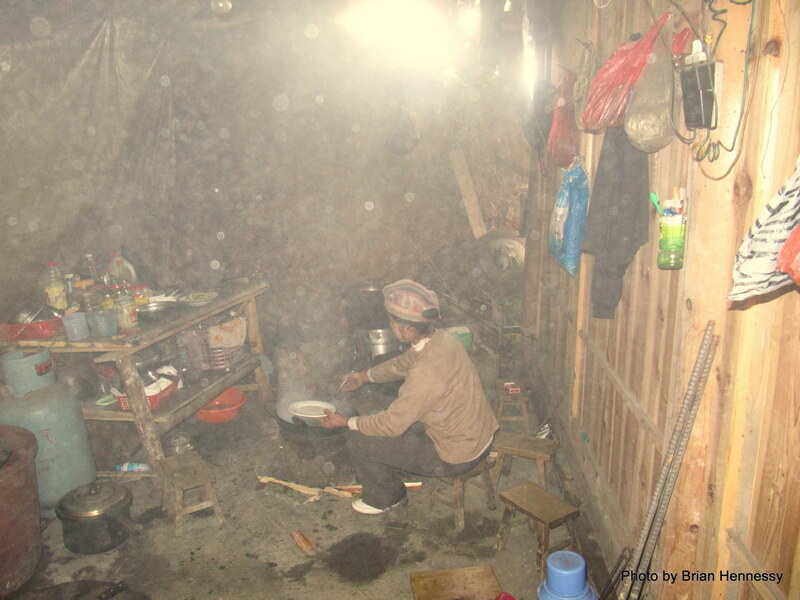 Many isolated areas in southwest China are similar. 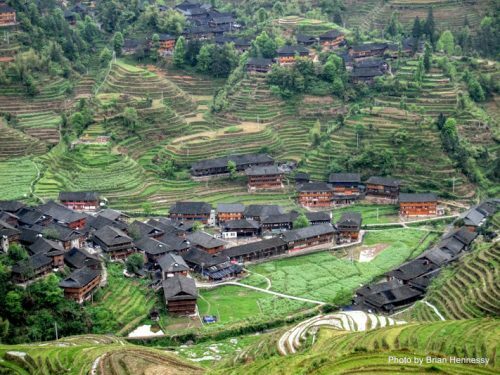 Nondescript towns crowded with commercially minded Han Chinese, and a beautiful countryside populated by minority peoples in their traditional villages who struggle to maintain their cultural identity. Some thriving, others dying. No flash hotels and restaurants in these back-country places, folks. That’s why you need a little Chinese language to find a bed, order a meal and a beer, and to make sure you catch the right bus out of town. You also need to be content with your own company for long periods of time. Useful companions might include a good book for reading yourself to sleep at night, some medicine for a headache or the runs, and a diary for recording your experiences. During my journey across this isolated region, I saw one other Western backpacker. Travelling rough like me and looking like he needed a good scrub and a change of clothes. Carrying everything he needed on his back and wearing good strong boots, he was hoofing it in the opposite direction. We nodded and kept walking. As you do. Alter egos exploring our own realities (a tip: avoid young backpackers. They need company and talk to much). 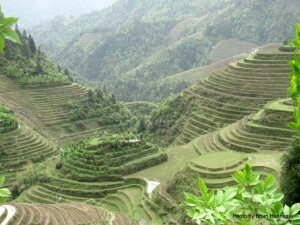 Anyway, my first stop was the Dragons Backbone Rice Terraces. Getting there was not easy though. I had arrived in Guilin too late in the day to get a bus, so I negotiated with a taxi driver to take me to a hostel somewhere close to the terraces (for the price of an overnight stay in Guilin). It was night, and it had been raining heavily as we crossed a mountain range. Landslides of mud, clay and stones were creeping across the road. Small rocks and stones occasionally bouncing across the gap. The driver asking if we should continue. Yes we should. He’s happy enough to do so because his girlfriend is along for the ride and he has plans to overnight in the township of Longsheng after dropping me off at a roadside dwelling somewhere near the terraces. We find a local family who agree to take me in out of the rain and provide me with a bed for the night. Warm and dry, clean and cheap accommodation. Nice people as well. The weather was good the next morning, so I was out on the road shortly after first light. 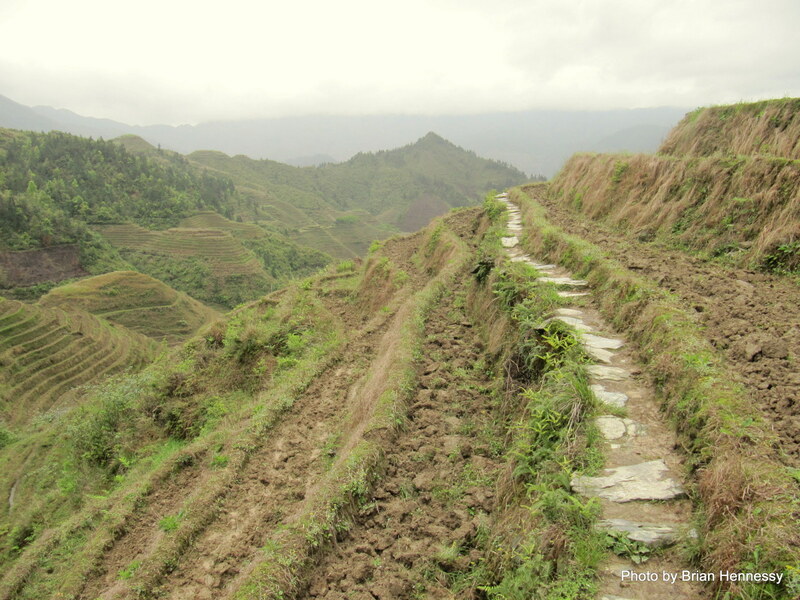 Walking north towards the Zhuang village of Ping’an at the centre of the terraced rice fields stepping up to the ridgelines above. Admiring the feats of agrarian engineering contouring the steep hillsides and appreciating the intelligent husbanding of limited topsoil in a mountain environment. This place is both topographically impressive and aesthetically stunning. A small bus came by and I flagged it down. It was headed to Dazhai, a Yao village further north. 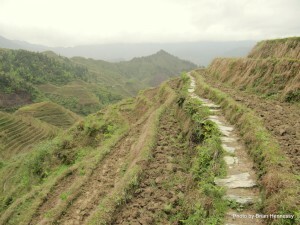 I could climb to the top of the ridge from there and then walk south to Ping’an. A middle-aged lady on the bus offered to be my guide, for the trail had many branches and it would be easy to get lost. She wore traditional clothing, was very short, and had beautiful long black hair wound around the top of her head. It shone in the sunlight. As I would soon learn, this was a very physically fit grandmother. In these mountains, you have to be. She put me to shame and left me for dead as we climbed. So I was glad when we stopped for a breakfast cooked over an open fire in a hut half way up the ridge (relatives of hers). A welcome break and a view of Dazhai below. 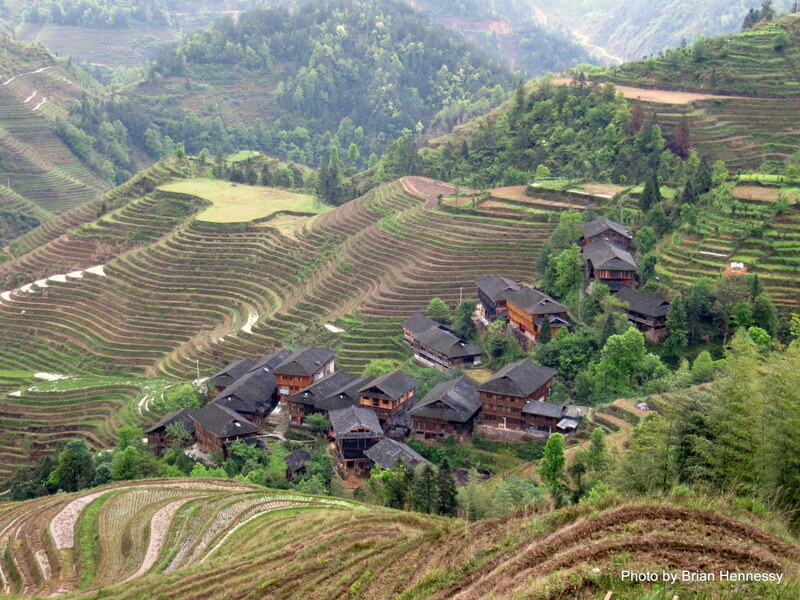 Multiple storied wooden structures laid out in an orderly pattern on the valley floor. Other dwellings clustered together on the slopes. 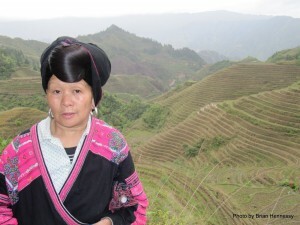 A fine picture of Yao minority adaptation to a remote environment. Thriving on its own terms at the end of the road, in a poor and mountainous part of China. Nobody to bother them here but the county government. The top of the ridge offers even more spectacular views. It was tough going though. Passing a Zhuang woman and waiting patiently as my Yao grandma chatted with her for fifteen minutes before we continued. Another welcome break. Giving a water buffalo right of way on the narrow track leading into the pleasant village of Tiantouzhai and having nice thoughts about living up here in the clouds for awhile and writing a book about the Yao. Buying some overpriced bottled water from an enterprising matron in a dingy little shopfront beneath her dwelling there, and discarding the living among the Yao fantasy. Rejoining the track and resuming the journey. 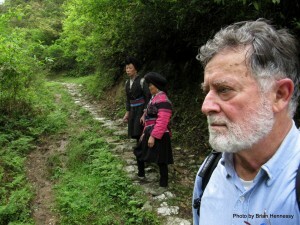 Descending to a beautiful little ravine with a meandering stream flowing past the village of Zhongliu. Thinking to myself that any half-competent painter could produce something wonderful from such an idyllic scene. 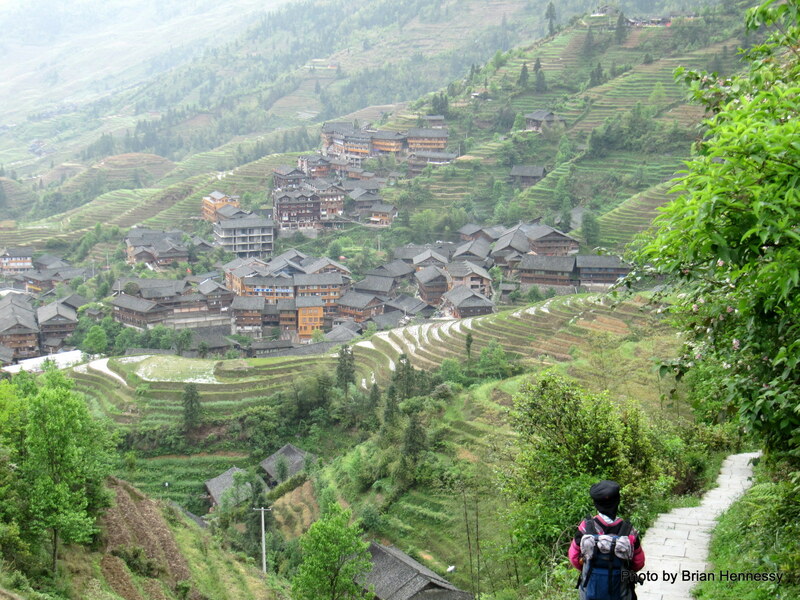 Two strong young men passing by, heading back up to Tiantouzhai with a load of household necessities on their backs. Ah, so that’s how madam shopkeeper gets her stock! 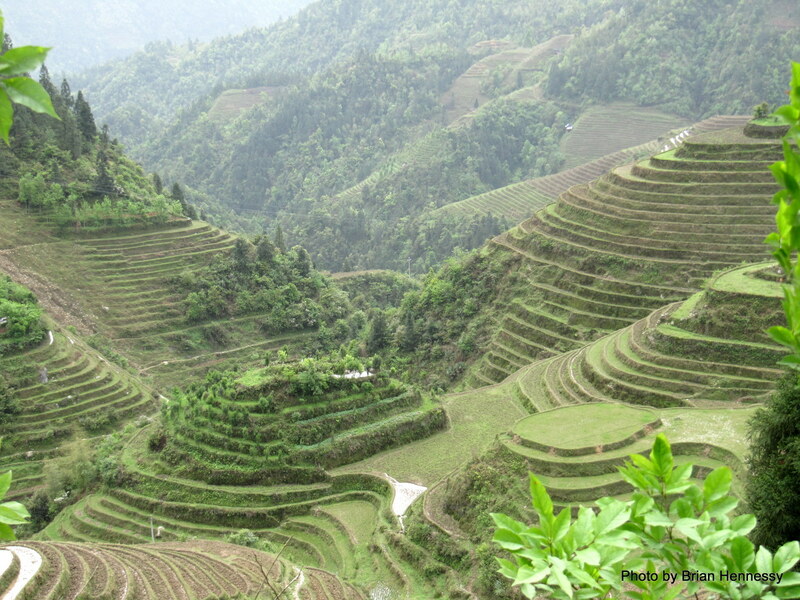 I wonder how long it took to construct these rice terraces. Generations. And did they just start at the bottom and work their way up into the clouds, or did they begin on the heights and work their way down: each succeeding generation adding layers to feed their growing communities? Where did the water come from up here on the ridges? Springs? Seasonal rain? 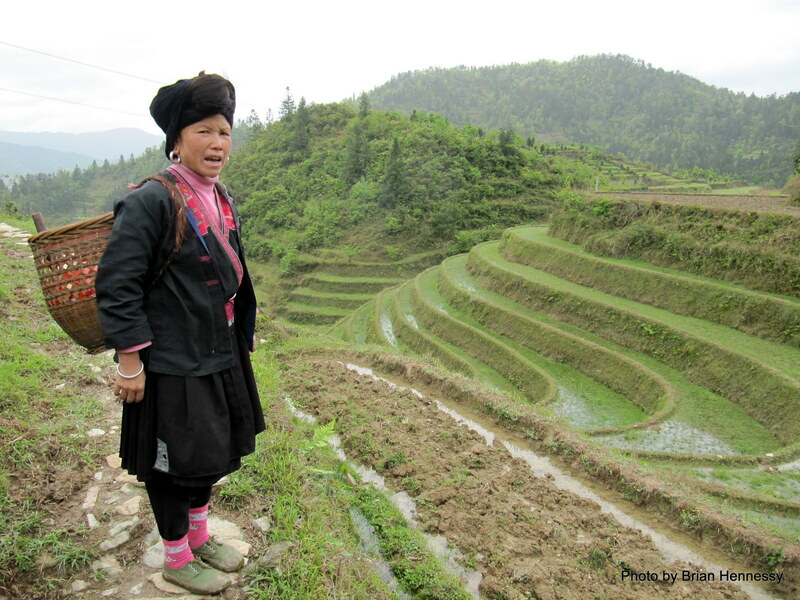 Surely traditional methods of irrigation could not raise water to these heights. I made a mental note to research the seasonal rhythms and the communal rituals and celebrations associated with them. It took half a day to reach beautiful Ping’an. A hike to remember forever and a destination prettier than its postcards. I paid grandma more than the going rate, thanked her for being both guide and packhorse, and took off to find something to eat on one of the charming balcony restaurants overlooking the descending terraces below. Not so fast. She followed me. The Zhuang waitress telling me that I was expected to buy her lunch. Fair enough. Then walking down the mountain to the road below, with grandma following again. My God, I hope she doesn’t follow me all the way home. I give her enough money for her bus-fare back to Dazhai and she wanders off without so much as a smile or a zaijian (goodbye). You’re a rich Westerner, don’t you know it’s your duty. I catch a bus going the other way. Back to Longsheng and a good sleep in a cheap Chinese hotel. Oh my weary bones. But what a trip! You should see the photos.